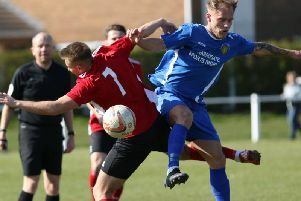 An 86th-minute equaliser saw Winterton Rangers leave Manse Lane with a point, cutting Knaresborough Town’s lead at the top of NCEL Division One. Luke Anderson struck late on to cancel out Brad Walker’s first-half opener, and victory for second-placed Eccleshill United means that they are now just six points off the pace. Steve Bromley saw an early shot saved by visiting gloveman Dale Coy, but Boro soon went 1-0 up in the 18th minute. Bromley’s through-ball sent Dan Clayton free, and he cut across the defence before reversing a pass to the unmarked Walker who had the simple task of knocking the ball home. Bromley then headed over from a left-wing corner before Walker had an effort kept out by Coy. The final chance of the first half fell to Rob Youhill whose shot was blocked wide for a corner kick. In the 49th minute, Knaresborough won a penalty when a Rangers defender kicked Steve Bromley as he tried to head towards goal, but, for the second game in succession, Dan Thirkell’s spot-kick was unsuccessful, Coy saving the low straight shot. Boro stopper Jack Rushworth was then called on to save from a header from Kieran Wressle as the visitors attempted to claw their way back into contention. Luke Anderson fired over for Winterton, but the hosts fought back and Thirkell’s free-kick flew over before a Ben Cohen effort was tipped over by Coy. However, Winterton continued to press at the other end and were rewarded in the 86th minute when they won a free-kick on the left which was driven into the area and headed home by Anderson for 1-1.